This veal, porcini and cavolo nero cannelloni was inspired by a recent trip to a local Italian restaurant where I had order envy! One of my fellow diners ordered a sumptuous veal cannelloni so I thought, ‘why not make a classic even more special?’. Veal mince is more widely available now and gives a lighter flavour but is still delicious. You will see that I have given you the recipes for the ragu and béchamel sauce but the photo is for the veal ragu served with spaghetti- ‘why?’ I hear you cry! Simple as this: time was short and hunger was high! We all get impatient from time to time but really do try it as a cannelloni! 1. I make the veal sauce in advance so it has plenty of time for the flavours to develop. Take a large pan and heat a glug of oil over a medium/ high heat. When the oil is hot, brown the veal mince. You may need to do this in two batches so the meat browns nicely. Remove from the pan and set aside. 2. If the veal has released a fair bit of natural fat then drain a little away. Return the pan to a medium heat and cook the onion, garlic and carrot for until softening but not so the onions are catching too much colour. Add the tomato puree and stir so it is well combined before cooking for a minute or two before adding the porcini mushrooms and thyme. 3. I have chosen to use a dry white wine in this recipe to keep it lighter but feel free to use red if you would like. Add the wine to the pan and heat until reduced by half; this will deglaze the pan as well as adding flavour. Pour in the stock and tomatoes and bring to a boil before lowering to a simmer. Cover the pan and cook for an hour, stirring occasionally. After the hour is up I then add the cavolo nero before giving it another half an hour or so. Season well. 4. Whilst the sauce is simmering away, you need to make the béchamel sauce which is going to top the cannelloni. For the sauce, secure the bay leaves to the onion halves using the cloves- this way you don’t have to go fishing around the saucepan to find the cloves later on! Add the milk to a small pan and bring to a boil before removing from the heat and allowing the flavours from the bay and clove to infuse for around 20 minutes. 5.Take another pan and melt the butter and flour together until a paste, or roux, is formed. Remove the onion, clove and bay from the pan containing the milk and slowly add the milk to the pan with the roux. Keep stirring so lumps don’t form! Simmer and stir until it thickens before removing it from the heat ready to pour over the cannelloni. 6. When the veal sauce is thick and reduced, you can get going on forming the cannelloni. Take the lasagne sheets and cook for a couple of minutes, drain and allow to cool until you can handle them. Each pasta will vary in time slightly so do refer to the packet instructions. Place a line of the veal sauce to one end of the lasagne sheet (not right on the end, leave a small gap) and roll. Place the pasta tube, seal side down, into a baking dish and repeat the process until the veal sauce has been used. Tuck each tube in snuggly. Pour over the béchamel sauce and grate over a little fresh parmesan. Bake in a 200c/ 180fan preheated oven for 20-30 minutes until golden and bubbling. 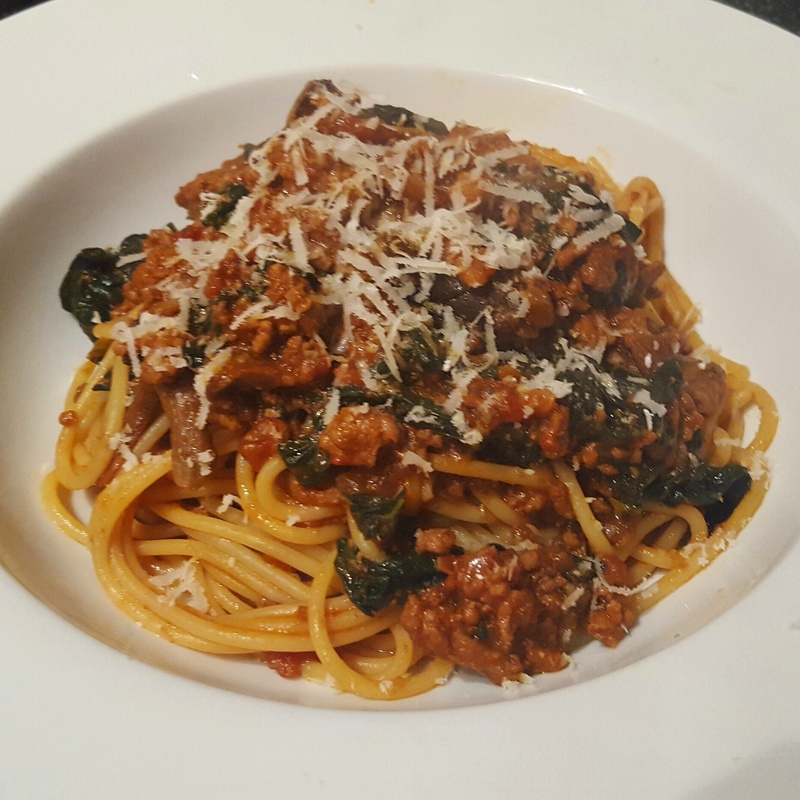 Veal, porcini and cavolo nero ragu which is fit for a king- a twist on an Italian classic! 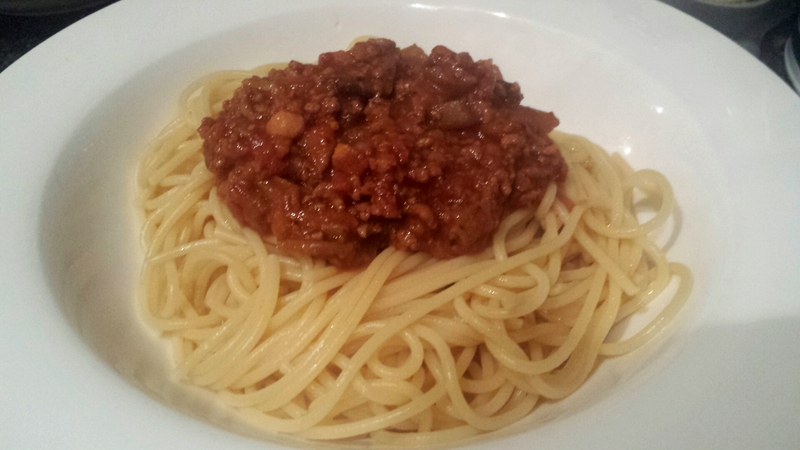 A great bolognese should be in everyone’s culinary repertoire so let me share mine with you. The key to a beautiful bolognese sauce, or ragu, is slow cooking so be patient! Also remember that Italians traditionally serve this with tagliatelle so use a good quality pasta so the sauce clings to every strand. If you’re not a huge fan of mince then substitute it with diced beef but remember that this would cook better in the oven on a low heat to ensure the meat falls apart. 1. To start, take a large pan and heat 1tbsp of the oil over a high heat and brown off the mince which will take a few minutes. I often use veal mince as it has a lower fat content and gives a lighter bolognese.
. 3. Take a heavy based pan (time to crack out my Le Creuset again!) and heat the remaining oil over a medium heat.Cook the onion, celery, carrot and pancetta until it all begins to soften and then add the garlic into the pan for 1-2 minutes until fragrant. Pancetta cubes are easy to find however if you want to ramp up the flavour even more then look for a small block of pancetta which you then cut yourself. This tends to have more flavour and a smokey note which you don’t get with precut cubes so head to the local deli and treat yourself! 4. Next the tomato puree goes in to cook off for another couple of minutes, followed by the red wine and aim to reduce this by half. Pop the bay leaf in and sprinkle the oregano. 5. Stir the tomatoes and balsamic vinegar in and crumble in the stock cube which will add an additional depth of flavour. Season to taste, bring the bolognese up to a simmer, cover and cook on the hob for 1- 1 1/2 hours or until the sauce has reduced and thickened. I also keep some of the porcini mushroom liquor back and add a little to give an extra meatiness. 6. When the bolognese is nearly ready cook the pasta and drain well. I add the pasta into the sauce to ensure each stand if pasta is well coated. Divide the bolognese between the bowls and serve with parmesan.